There are countless activities to keep a toddler happy and occupied on a rainy day. The challenge is uncovering the ones that help develop their little minds and bodies–especially the projects and games that require neither money to obtain nor lots of time to prepare. These fun pastimes get children from 18 months to 3+ years moving and grooving! These activate also help develop communication, gross and fine motor skills, problem-solving skills, self-control, and social skills: the usual suspects to promote healthy, intelligent, awesome kiddos. So get moving! Engage, inspire, and most importantly, have fun! Go on a scavenger hunt for colors. Let your child pick her favorite color, and encourage her to find it on home décor, toys, pillows, paintings, and more. Then pick another color and look for it just in one room. Then pick another color and count how many times you see it. Then pick another one and another one…. Turn off the lights, close the curtains, and shine flashlights on the wall. Make patterns in circles and lines, and have him imitate your movements. Next, prop up the flashlight with a pillow so your hands are free to make shadow animals. Can your child guess the shape? Adorable animal noises optional. Climb over, around, and on top of pillows scattered on the floor. Use bed pillows and throw pillows of all shapes, colors, and sizes. The greater the variety, the better. All the jumping, balancing, and following directions promotes gross motor and cognitive skills; and toppling over is no problem- it’s fun! Throw sock-balls into your laundry basket. Start with the laundry basket very close to your child, and personally show him how it’s done so he can mimic the action. Once your future basketball star gets comfortable with the objective and motion, slide the basket a little further away and practice even more. Pretend to be different animals from the farm, the wild, and the ocean. Chuckles will abound once both of you are impersonating the sounds and movements of your child’s favorite animals. Take an imaginary trip to another environment, describe the surroundings, and see what your ducky does next. Stretch. Yoga experience not required. Stretch tall like a tree, and keeping your legs straight, bend down to touch your toes. Stretch your arms out wide and reach from one side to the other. Next, have a seat and position her little legs into a diamond shape. Can she bend over and smell her adorable stinky feet? Place masking tape in a squiggly line on the floor. Balance on it, walk along it, or jump over it. Duct tape, masking tape, or packaging tape work great. Any colored, thick tape that won’t ruin the floor or rug when removed will do. This exercise is a great confidence booster once she accomplishes the specific task. Follow the leader. At this age, and especially at first, your being the leader is highly beneficial for your peanut to become familiar with the game. Toddlers love to imitate. Start small with clapping hands, making faces, or bouncing like a bunny. 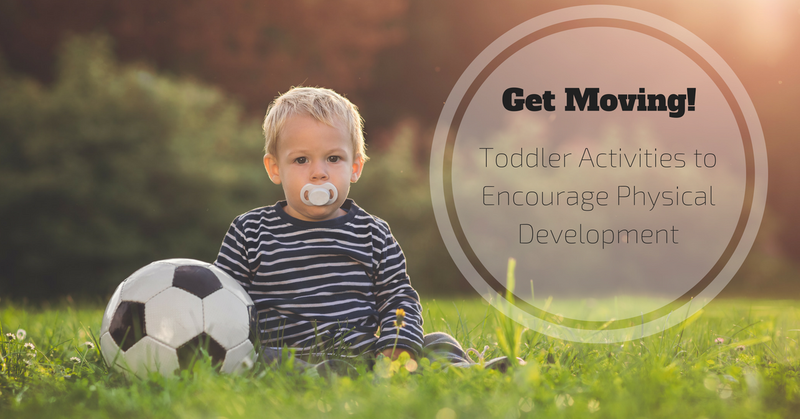 And if your toddler can take the lead, absolutely encourage him! Build a fort with pillows, sheets, and furniture. Where art meets engineering, a great pillow fort is born. Use lightweight sheets and blankets to drape between chairs, tables, or a sofa. Anchor the sheets by tucking them into the furniture, or placing books on top. Add pillows and cushions to the floor, and cuddle up. Three words: Hide. And. Seek. It may take a few practice rounds as this game is absolutely thrilling for most children, and they sometimes get too excited to stand still or be quiet. Establish rules like staying on the first floor, and counting to 10 with eyes closed; then hide and seek behind furniture and corners. Dance. Internet radio and cable radio stations offer a plethora of choices to introduce your child to new sounds, rhythms, and tempos. No need to stay on one channel for the whole song. Get silly, get slow, and eventually use the pause or mute button for a fun game of freeze dance. Shake your groove thing! Enjoy an old fashion game of Simon Says. Have your toddler put on his listening ears and practice following direction only if you say “Simon Says.” Simons says arms over your head, moo like a cow, jump up high, run in place, give me a kiss. If your child doesn’t wait for “Simon Says,” prepare for tickles! Toy treasure hunt. Enjoy the preparation as much as finding the toys. Walk with your munchkin around the house and choose his favorite small toys. Next make a pile of blankets, sheets, or freshly washed clothes, and bury the toys in the big pile. Now dig in! Can he tell which toy it is without first pulling it out? Keep as many balloons in the air as possible. The sight of a single balloon is one sure way to make a child smile. But several balloons? Now that’s a party! Inflate four to six balloons and try to keep all of them simultaneously in the air. Tap, pat, and swat your way to fun, all while ensuring a spacious place to play. Now turn off the TV and get active. It doesn’t take anything more than items around your house and a little imagination. Bond with your child, be a positive role model and encourage independent movement with plenty of giggles along the way.